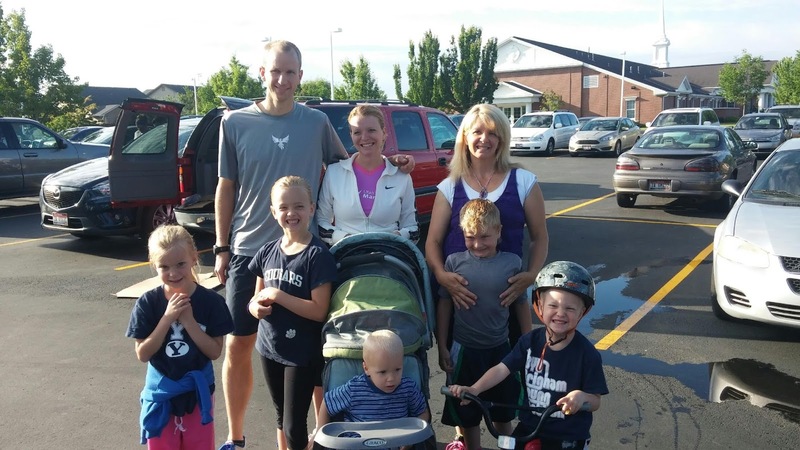 Each year the local Brigham Young University alumni group puts on a nice 5k fun run in town. The premise is a “freshman send-off” to congratulate freshman that will be starting at BYU. Over 200 freshman from the Treasure Valley are going to BYU this year, and about 10 of them were at this event. This year’s event happened to fall the week after I ran the Newport Marathon. After a week of rest, I decided it would be nice to break out the running shoes again. Besides that, the fun run makes for a great (and cheap) family event, so it was a good opportunity to get the kids out running. How cheap? Well, the fun run was actually free. They charged $5/person and $20/family for breakfast of blue pancakes, sausage, and fruit. When you have a family of seven, that’s a pretty good deal. Most local 5k’s are $15-$30, although those often come with a t-shirt (unlike this BYU fun run). Our children really enjoy doing fun runs. In the past I’ve made the mistake of pushing some of the kids a little to hard, so I try to just tell them to do their best. We are genuinely proud of them when they put in a good effort finish a 1 mile or a 5k. They love nothing more than getting a ribbon, medal, or t-shirt, but they also get great satisfaction out of finishing a race. 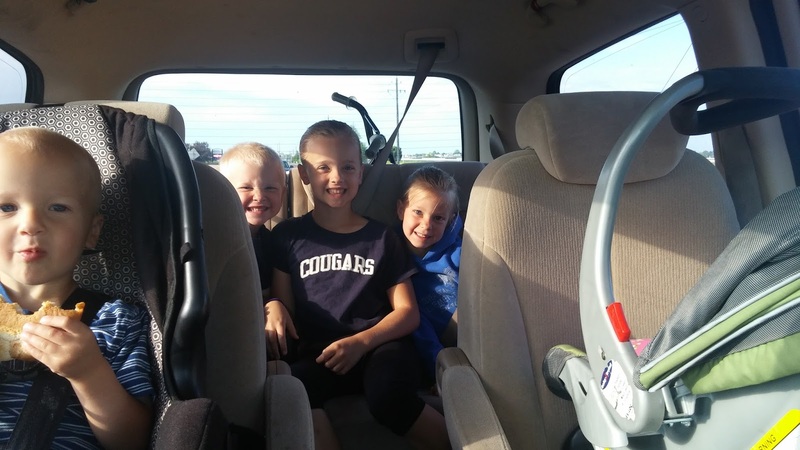 On our way to the BYU Alumni Freshman Send-off 5k; kids are excited! This particular 5k starts at a church and does a ~1 mile loop around Rocky Mountain High School and then an out and back to finish the 5k. I planned on doing the 5k and Cyndi and the kids planned on doing the 1 mile loop. (Cyndi just had a baby and hurt her foot a few weeks ago, so she’s not quite back to running yet.) Cyndi’s mom, sister, and niece and nephew were also in town to join us. The family is ready to run (or ride)! The 5k started with the typical barrage of kids sprinting out front. Paisley, our 8-year-old, went with them and I followed close behind. After a couple hundred yards the excitement had subsided along with the kids’ pace. There was some confusion about the course, and since I had run it a couple times before, I took the lead. Some younger guys, probably recent high school grads, stayed close behind me and let me guide the way. My knee hurt quite a bit about a quarter mile into the race, but after another quarter mile the pain went away and I was happy about that. We looped around the high school and began the out and back. I noticed my calves were burning much more than usual, and I attributed this to the previous week’s marathon. Once we hit the turn-around the young guy behind me made his move and passed me. Racers were pretty spread out after him, so I figured I could at least take second. I tried to keep with him but my legs were screaming more than usual and he was moving pretty fast, so he slowly expanded his lead until he won by about 50 yards. On the way back I passed Paisley, who had mistakenly missed the turn to finish after just 1 mile and was now well into the 5k course. She was just realizing this and was starting to tear up, so I told her she was doing great and to work hard but that it was ok to walk if she needed to. Later on I came up on Fielding, age 4, who was on his little bike and was just following the crowd. He was happy and chugging along like 3 miles on a bike was no big deal for a 4-year-old. I finished in 18:30, which I was completely satisfied with. That may be my post high school 5k PR depending on whether my watch was correct (I think it was). In any case it was really close. After the finish I doubled back so I could jog/walk with Paisley. I saw Cyndi and the other kids and family finishing up the 1 mile loop as I made my way back out. Cosette, age 6, was apparently a bit more tired than the last run and hitched a ride in the stroller for a portion of the mile. A little while later Cyndi came by in the van, worried about where Paisley and Fielding were. I told her I had seen them earlier and was making my way back to find them, but she was still worried. I found them about 0.75 miles later. Cyndi had also found them and was loading them in the van. They had already hit the turn-around so I asked if they just wanted to finish with me and they excitedly obliged. So Paisley, Fielding on his bike, and I made our way back to the finish line. Paisley alternated between jogging and walking and Fielding kept up a pretty good tempo on his bike as long as he didn’t get distracted by rocks or bugs. It’s amazing how little an 8-year-old can regulate her pace! She would be exuberant one moment and exhausted the next. Overall she did really well and finished in under 40 minutes. It was a great day for a run. Everyone had a good time and we ate a delicious breakfast afterwards. I’m glad we could have another truly fun run with the kids. I hope they all grow up to be runners!